My first “job” was a summer job, as playground supervisor with the Halifax Playgrounds Commission in 1954. I had to go to work because of the shortage of income with my father deceased. In 1955, my mother knew a family (I forget the name) where a chap had a company which sold welding equipment and supplies. It was called Industrial Engineering. At my mother’s request, this chap hired me as an office clerk. 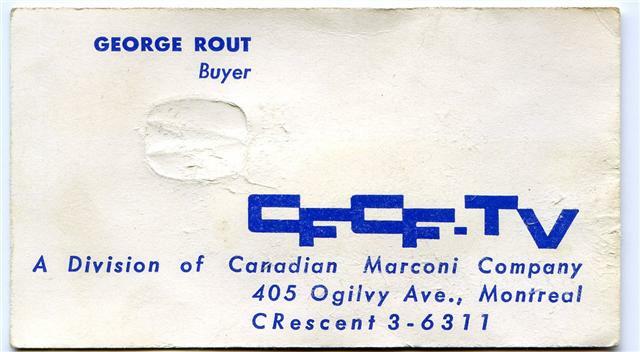 I stayed there a few months and I heard of a British electronics company, Cossor Canada, who were setting up shop in the cattle sheds of the Halifax Forum!!! Fortunately, the production manager, Ron Smith, joined the North West Arm Club with a small plywood outboard and he and I became friends. 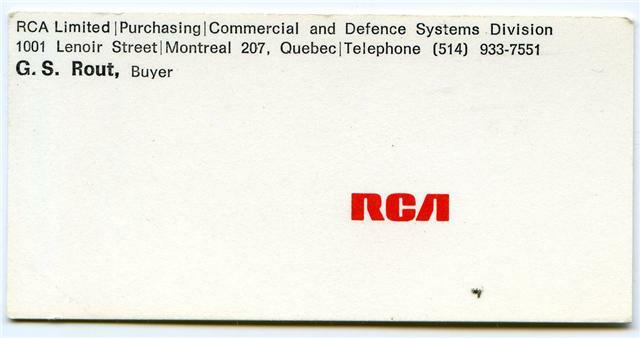 I asked about working there, and he suggested to (the late) Dave Renner to give me a chance, so I became famous (in my mind) as the Assistant Purchasing Agent for Cossor Canada responsible for purchasing office supplies, cleaning materials and gradually more items such as electronic parts. It was like a big family working for Cossor. 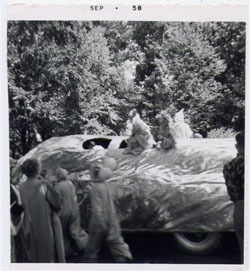 We had a Cossor Social Club and we used to rent the Halifax Forum for skating sessions, have picnics and even had a float of the Purple People Eater in the Halifax Natal Day parade. 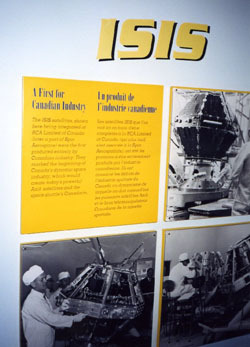 Cossor Canada was competing with Sparton Of Canada in the contracts for building sonobouys. These were devices dropped from military planes with a microphone and transmitter which would transmit audible signals of (Russian) submarines suspected of being off the coast of Nova Scotia at that time. 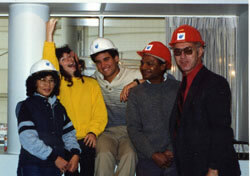 I enjoyed working for Cossor, made lots of friends, even had a Cossor Band with other employees. Cossor was bought by EMI and became known as EMI-Cossor. They also made some commercial record players for the Nova Scotia education system, known as ERF (Extended Range Frequency) players. Cossor also had a project for the building of Ionosphereic Recorders which were installed at remote locations in the world. As was to become typical in my career, I got bored with ongoing work and wanted other challenges. At the time, I had a girlfriend, Maxine Murray, who was going to Montreal to visit her sister and brother-in-law (Air Force) who had just completed their 3-year stint in Germany. I also had an aunt and uncle living in Ville La Salle. Being a keen radio-communications-television-electronics fan since I was a kid, I wanted a tour of the “big” Canadian Marconi plant on Trenton Ave. in the Town of Mount Royal. I went on the pretence of looking for a job andc at the reception, I asked to see the Personnel Manager. As luck would have it, Charlie Macluaghlin came out and couldn’t have asked a better question, “Are you interested in working for a television station”? I was ecstatic. He asked that I go see Creighton Douglas the Chief Engineer (no less) at CFCF Television. It was on the 2nd floor of a two storey strip plaza at the corner of Jean Talon and Hutchison Sts. 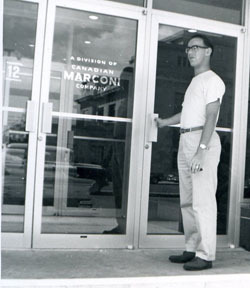 It had the Channel 12 CFCF Marconi Television logo on the door. But, inside there were just a handful of people. As fate would have it, Creighton was in (because all the time I worked there he was seldom in the office!!!). He was busy but took the time to interview me. I answered all his questions and we agreed that I would go home to Halifax, give my 2-weeks notice and come back. The only thing missing in my mind was “Where is this television station”? 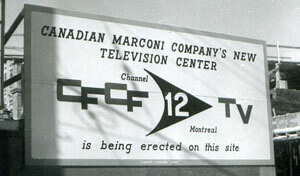 When I exited the building, I walked the wrong way, but luckily, at the end of the block was this huge sign in a vacant lot –“THIS IS THE SITE OF CANADIAN MARCONI’S NEW TELEVISION STATION, CFCF CHANNEL 12”. All the lights came on in my head, everybody assumed that I was applying for the job because I was aware of it, which I wasn’t. 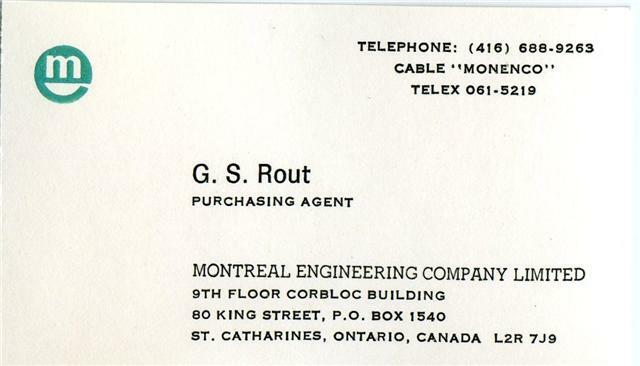 I moved to Montreal two weeks later (summer 1960) as promised and it was an exciting job to be part of the team as “Buyer/Assistant-Engineer" putting together Montreal’s first private TV station. So exciting it was that we were working around the clock from 8 a.m. to 2 p.m. but, being young, the excitement overruled one’s health. The station was scheduled to open in the fall of 1961 and the deadline was met. A week before the opening, I was feeling terrible, and went to the Marconi company physician. My pant legs were shaking, and he said, “George, you’re exhausted, I want you to go home right now and don’t come back for a month”. I had to watch the opening on TV!!! After the station was on the air for six or so months, all the electronics were in, the purchasing became maintenance and some additional modifications were made to the studio and transmitter facilities. With all the excitement over, I looked for other challenges. Sperry Gyroscope Division of Sperry Rand Canada had an ad in the paper for Electronic Buyers - right up my alley. I applied and started overtime on a Saturday in September 1962 before my official Monday, as they were so far behind. On my desk were piles and piles of unprocessed requisitions for electronic components. Sperry was basically a defense contract plant, you had to wear your colour-controlled security picture badge on your shirt pocket or belt only. Strictness was supreme. The colours on your badge allowed you access to only those plant areas which matched your badge colours. Sperry had a large contract for the U.S. Air Force for the gunships control electronics for the Vietnam war effort. There were several hundred people working there. I was designated a Senior Buyer with the Electrical Group headed by the late Norm Wylie, a super nice chap. 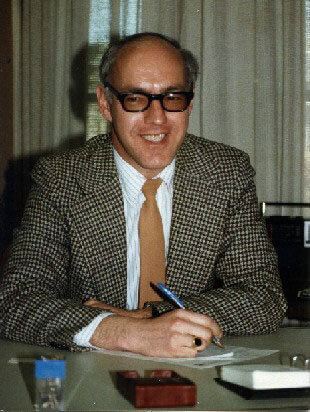 The Mechanical Group purchasing was headed by Colin Bowie. Both groups had several buyers and expediters and support staff. Norm & Colin reported to the Purchasing Agent, who at that time, was Herm Eberts. It was another nifty place to work, but the work was always by contracts, your job was on the line if the company didn’t get this or that contract. Sperry also got into Numerical Machine Tool Control, the product known as UMAC5. It was the infancy of computer-controlled machine tools. Without going into detail, it was suffering from the correct mating of software developers and machine tool designers, and had a painful and problematic life. 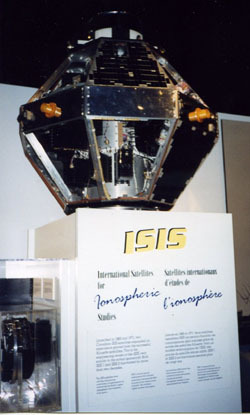 Seeing that things were not going well, it was time to jump ship again and, in 1968, I was hired as the Project Buyer for RCA’s Aerospace Division for the ISIS A & B satellites. Again, this was the epitome of a team project. The end result was to have the satellites ready to be launched on their scheduled date, otherwise, you could lose months in delay while other sattelites were launched ahead of yours. The project was scheduled as controlled by “Critical Path”, the latest in project scheduling of the day. It necessitated a meeting every day without fail with Joe McNally, the Project Manager, to see where there were problems pacing items and when action was required. After the projects were finished, again, the work was dependent upon other contracts which were too far off in the horizon, so I transferred to the RCA Service Division, but this was boring and it was time to move on again in 1975. There was an ad in the paper where Montreal Engineering Company (Meco at first, then Monenco) was looking for senior project buyers. Interviewed by the late Walter McColm, I was hired on the spot and began working on my first large project, it being a Kimberly-Clark (K-C) mill project at Terrace Bay, Ontario. Of all the projects I worked on with Monenco, I never visited the sites!!! After the K-C project was wrapped up, I was involved with a heavy water plant at LaPrade, Quebec, but still working out of our Montreal office. The heavy water process had been a political football for several years and this was no different. After eight million dollars or so were poured into the site, it was ploughed into the ground as the Separatists came into power in Quebec and language rules changed immediately. 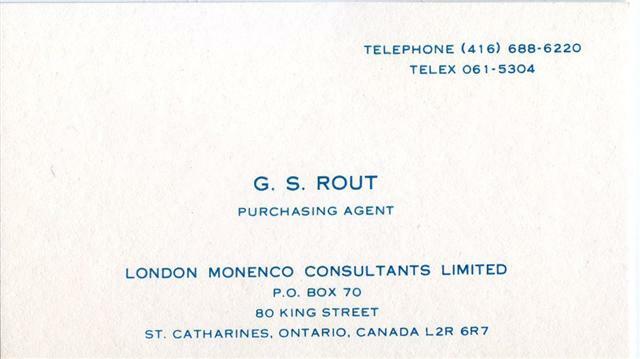 Engineering companies deal in English only, and Monenco moved a great part of its operations to St. Catharines, Ontario in 1977. I was working on the end of an Ontario Hydro Thunder Bay generating station project, and a newer one was following at Atikokan, ON. These megaprojects were doing well, until interest rates climbed dramatically as did oil prices. In 1980, the projects went down the tubes or were downsized, and many of the project staff got laid off from the company in due course. I managed to hold on until 1982, when the Ontario Hydro project finished and then I was out of work for six months. Now located in St. Catharines, I found out that work in other than General Motors and similar older technology was pretty scarce, so it was obvious to look into the Greater Toronto Area for work. Not driving because of my poor vision, it was a tiring hassle to travel back and forth daily with a chap I knew. However, in January 1983, I was hired by a nifty company on the cutting edge of technology, right up my interested alley. 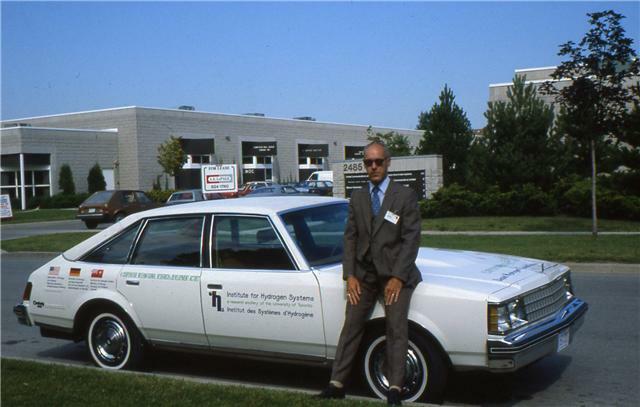 It was called the Institute for Hydrogen Systems (IHS), a small group of scientists and some engineering and support staff who were working to develop hydrogen as an alternate to fossil fuel and also to develop fuel cells. 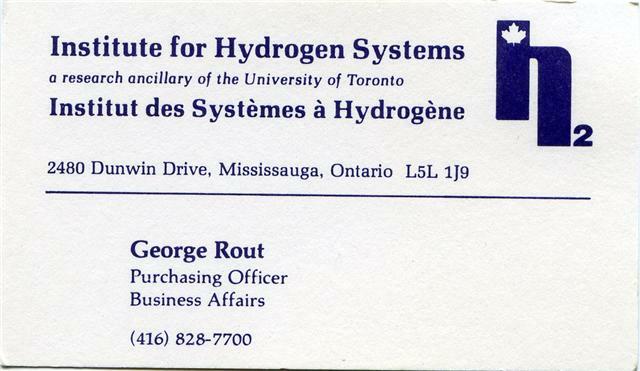 This group was part of the Engineering Department of the University of Toronto, but when the oil prices climbed, there was political interest in the new technology and it was moved out of the U of T engineering department to be an ancillary of the U of T itself. It was funded by the U of T, the Ontario Ministry of Energy, and a Federal Government Research department. 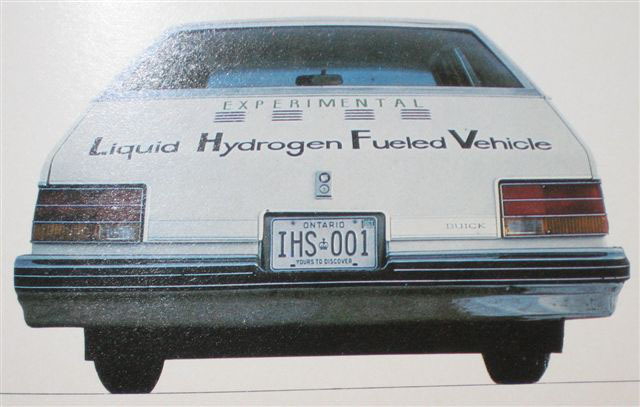 We had a 1979 Hydrogen powered Buick which I thought was quite cool. Again, I was ecstatic about working with scientists on this new application. Two years later, oil prices decreased and politicians saw no more interest in the projects, albeit, the fuel cells that were developed in the early 80s have been refined for some of today’s vehicles. Seeing the writing on the wall of the company closing down, I searched out yet another and last facet of my career. 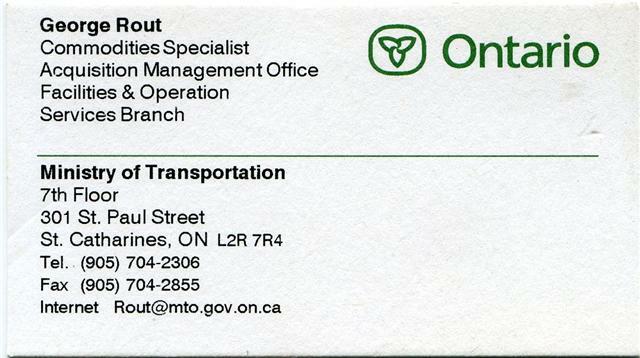 In Sept. 1985, I joined the staff of the Ministry of Transportation and Communications of the Ontario Government, becoming a civil servant. I came at the right time as times were changing for the way in which civil servants worked, and many were neither comfortable or happy with change. The work of a Civil Servant Purchasing Officer is normally very boring, with repetitive contracts, i.e. road salt for winter, construction items, vehicle parts for summer. Rather than spend my days on such repetitive contracts for thousands of items required by the ministry, I soon saw the prospect of being a “project buyer” as I was with Monenco and the IHS. 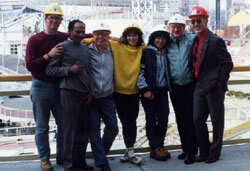 EXPO 86, the World Exposition, was being built in Vancouver. 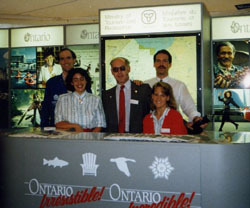 Ontario was participating with the third largest pavilion, spending $25,000,000. While I never thought of being part of the project, many of the sub-projects interested me, and one day there was a discussion about the special screen being built in Britain for the pavilion, the project was late, and it was one of the major attractions for a 3-D movie. I asked if I could be of some help, and naturally wasn’t turned down, and was successful in meeting the schedule. All of a sudden, there were other projects running late, the restaurant equipment, furniture, and on and on. 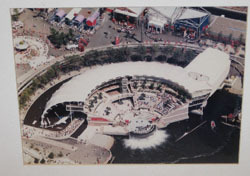 It was rumoured in the national newspapers that EXPO 86 would be opening in May 1986 without the Ontario Pavilion being completed. This did not sit well with the politicians. The Director of Supply & Services, Bob Cartwright, asked if I would go out to Vancouver for a few weeks to assist in the expediting of the materials, which I did. The pavilion Director of Finance, Bob Whitelaw, briefed me through the prioritized requirements. Because I was a late-comer on the project, no accommodation was included for me. However, there was a VIP suite 2-bedroom apartment in a condo with the pavilion Commissioner and two Deputy commissioners, fully furnished and serviced and overlooking the EXPO site. It was intended to be used for the Premier and ministers when they visited. However, it was realized that the suite was not totally suitable as usually the Premier, ministers and other VIP visitors had their entourage with them, and no such facility was available in the condo building. So, I was asked if I would mind the apartment. I consider this was when my career peaked, living in a two-room condo overlooking the EXPO site. All my friends thought I was king!!!! We like to say that “As the painters were going out the back door, thousands of visitors were entering the pavilion”. But, all good things come to an end, and in November of 1986, I issued my last contract, that being for the demolition of the pavilion. It had been another excellent team project. I returned to the Downsview office and became involved in other technical contracts, i.e. 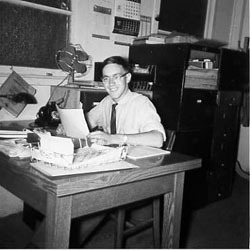 computers and outsourcing, which had become the modern method of doing business as opposed to buying, warehousing, and redistributing stock as was the case over many years. 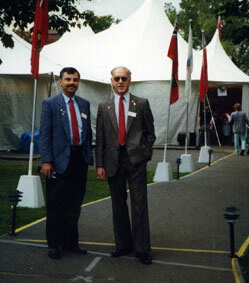 In 1987, French-speaking governments of the world decided to hold their 2nd Francophone Summit in Quebec City. Not to be taken lightly, Ontario decided to participate strongly with a large display in the form of a huge tent in a downtown park in Quebec City. 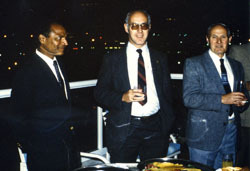 The chore was handed to Bill Rathbun who was one of the Deputy Commissioners of the EXPO 86 Ontario Pavilion in Vancouver. Bill called for another chap (Dennis Gabord) and myself to make this project work, and it was an enjoyable and satisfying teamwork project for three months start to finish. The balance of my career with MTO (as the Ministry had become known) was projects and large contracts. The use of computers in all facets of work meant coordinated effort with all the government ministries as well as technological changes. For example, in days past, highways were monitored by patrol employees in vehicles driving from point A to point B and radioing in road conditions, if ploughing, sand or salt were required. Always wishing to reduce the labour intensive work, improvements in technology allows sensors to be placed in highway surfaces, connected to roadside computers with data on the surface temperature, etc being transmitted to a central control station. Another example was the installation of kiosks at shopping malls for motorists to pay for the licenses, etc. In October 2001, my 80 factor came up, that is, the sum of my age and years with the Ministry which allowed me to leave on full pension. Therefore, after 46 years of the best enjoyable career ever in purchasing and contracts, I shut the door completely on employment and tuned into the leisure phase of life.